You apply the Hyperlink or FollowedHyperlink style to some text. If you create a hyperlink using Insert > Hyperlink, Word creates a hyperlink. By default, when you type something in a Word document that smells like a web address or an email address, Word automatically turns it into a hyperlink. You can insert a Hyperlink field, either by typing it directly or by using Insert > Quick Parts > Field. You'd think that Word would format the hyperlink in the same way in both cases. I always thought so. But I was wrong. By default, when Word formats a hyperlink, the hyperlink appears blue with a blue underline, and a followed hyperlink appears in a purple-ish, violet colour, with purple-ish violet underline. Word has built-in styles named "Hyperlink" and "FollowedHyperlink". "Hyperlink" is blue. "FollowedHyperlink" is purple-ish violet. You could be forgiven for thinking that when you or Word create a hyperlink, Word automatically applies the Hyperlink or FollowedHyperlink character styles. But… you would only be half right. It only looks like Word is applying the Hyperlink and FollowedHyperlink styles because, out of the box, they have the same colour for text and underline. If you modify the Hyperlink and/or FollowedHyperlink styles, you can set a different colour for the text and the underline. Let's say green text and a pink underline. If you apply that style to some text in your document, Word will correctly format the text in green and give it a pink underline. But… when Word automatically creates a hyperlink, or if you create a hyperlink using Insert > Hyperlink, Word does not properly apply the Hyperlink or FollowedHyperlink style. It will have green text, but the underline that should be pink will be green. Word displays the hyperlink's underline in the same colour as its text. So, it's very easy to end up with a document that's a mess. If you happen to apply the Hyperlink style yourself, the hyperlink will have a pink underline. If Word formatted the hyperlink automatically, it won't have a pink underline. 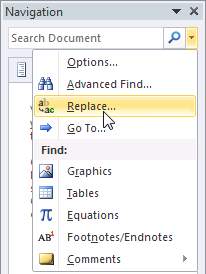 Figure 1: In Word 2010, click the little arrow in the Navigation Pane and select Replace. To see the Navigation Pane, on the View tab, tick the Navigation Pane box. You can fix this problem, and have hyperlinks display as you have defined the Hyperlink style. Open the Replace dialog. To do that, do CTRL-h. Or, in Word 2003 or earlier, do Edit > Replace. Or, in Word 2007 or Word 2010, on the far right of the Home tab, click Replace. Or, in Word 2010, use the little menu in the Navigation Pane (Figure 1). Click in the Find what box. 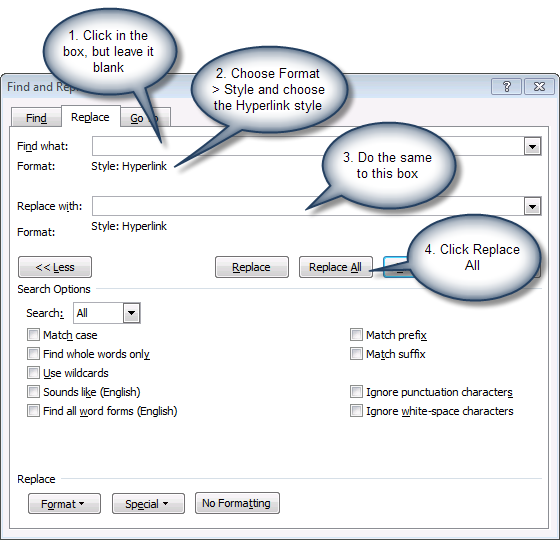 Click in the Replace with box, then click Format > Style and choose the Hyperlink style. Leave the Replace with box empty. This will apply the Hyperlink style as you defined it to all links, including links in headers, footers, footnotes, endnotes, text boxes, SmartArt and comments. You'll have to re-do the search and replace if you add more hyperlinks to the document. So this is a one-time fix, rather than a genuine workaround. If you apply a paragraph style to a paragraph that contains a hyperlink, and Word does not adjust the font of the hyperlink to match the paragraph style, then the Hyperlink may have acquired a font in its definition. Word won't respect the font, but it will won't respect the font of the underlying paragraph, either. To fix this: modify the style. Specifically, in the Modify Style dialog, choose Format > Font. Delete anything in the Font box. OK, OK to get back to your document. When you create a table of contents, by default Word links the entries in the table of contents to the headings in the document. It tells you that it has applied the Hyperlink style to these links. But it does not apply any of the characteristics of the Hyperlink style. The table of contents entries display the formatting of the TOC 1, TOC 2 etc styles that Word uses to construct the table of contents. So the Hyperlink style is there, but is not put into effect. When you create a cross-reference (using Insert > Cross-reference), Word makes the cross-reference a clickable link. But it doesn't format the link with the Hyperlink style. When you use the GOTOBUTTON field, Word makes a link that you must double-click. But it doesn't format the link with the Hyperlink style. See Suzanne Barnhill's article Common Hyperlink Problems.